Gosh! I like a challenge, but this one is a doozie. I’ve been commissioned by a Prep teacher to make her class a mascot. I’ve made a number of mascots in the past for classes, including a Ringmaster called Petey Barnam and a tree named Mr Barkly Tree (named by the kids in the class) but this time the teacher asked the kids what they wanted and they unanimously agreed that they want a zombie. Cool! Cool kids (all aged 5-6) but tricky. You see, a zombie is an undead human or animal who’s body is rotting and dropping off. How the green hell am I going to do that for kids, still give it enough details to make it look like a zombie but not too many gruesome details so that it scares the kids? Research, my friends, research is the key. 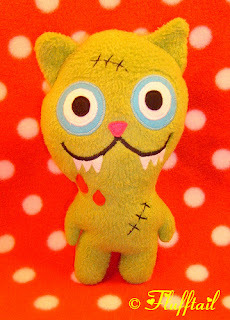 This cat zombie is from Flufftail and was found here. I like that it seems happy to be a zombie, which a lot of zombies don’t seem to be. The green skin is certainly a zombie tell-tale sign and the scars are good, although also a bit pirate-y. The fangs and blood are cute but I don’t know that they’re ok for little kids. Even little kids who ask for zombies. This guy is great too. He’s by Freshmade and was found here. Again he’s cute and not scary and doesn’t look like he minds being dead and zombiefied. 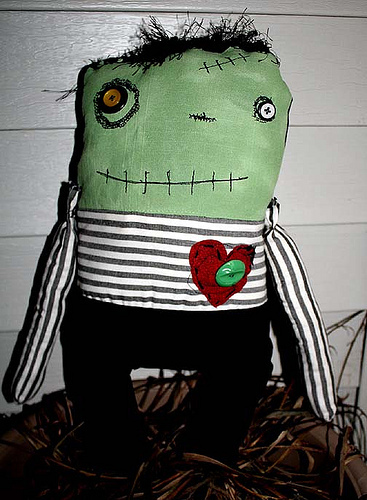 Then I stumbled across this guy, Herman2 from thEm doLLz. How great is he? The eyes pointing in slightly different directions and the size of the eyes relative to the size of his face makes him seem simple and happy rather than threatening and menacing. The heart also helps with his friendliness. The striped shirt also lends a Tim Burton feel to him, which is cool although I’m not sure that helps with the friendliness. So that’s what I need. 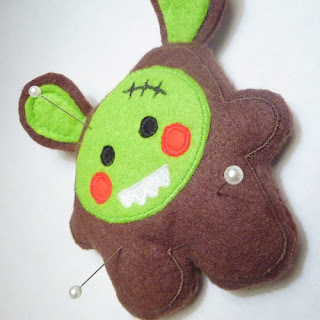 A happy, friendly, unthreatening zombie who little kids wool deb happy to hug. And now I’ve figured out how to do it, with a little help from research.